Born in Memphis and starting his career in 1974, Russell Jackson moved to Chicago in 1976 and gained his blues ‘stripes’ working with Otis Clay, Buddy Guy, Bobby Rush and more. He also played with greats Luther Tucker, Matt Murphy, Kenny Neal, Lucky Peterson, Katie Webster, Charlie Musselwhite and Willie Nelson. From 1979 – 1986 Russell toured exclusively with B.B. King. He was the first artist to put slap bass onto a lives blues recording (Live at Ole Miss (1979)). In 1990 he relocated to Vancouver, British Columbia (Canada), joining the Powder Blues Band and recoding with Long John Baldry (It still Ain’t Easy) and Kenny “Blues Boss” Wayne on his Juno award winning CD and continues to record and perform with Kenny Wayne to date. 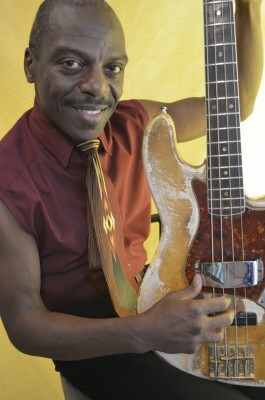 The birth of the Russell Jackson Band came in 1992 where he released three CD’s of his own material. From 1994-1997 he was a regular opening act for the Kansas City Blues Society at the infamous Grand Emporium for acts such as Son Seals, Five Blind Boys of Alabama, The Holmes Brothers, etc. From 2003 to present, Russell is the Musical Director for The New Generations of the Blues European tours formerly named The Chicago Blues Festival. Recently relocating to Austin, Texas after living in Canada for 22 years, Russell is regaining his reputation on the stand up bass, Russell recently joined and tours with Shawn Holt and the Teardrops.